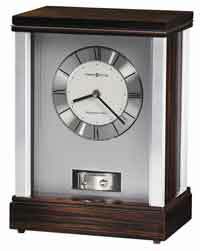 The Howard Miller Aston is a larger desk or table clock and features a Macassar ebony finish with a Black Satin top and base with polished silver accents. The dial is a brushed silver-finished panel with a polished silver ring around the black Arabic numerals numerals. A thermometer gauge to indicate the indoor temperature and a hygrometer which will indicate the humidity are located below the dial. Accurate Quartz, battery operated movement requires one AA sized battery. 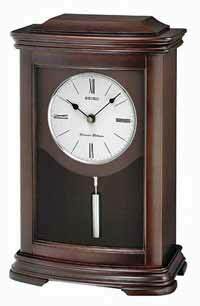 Size: Height 11" Width 8.25" Depth 3.75"
Clocks for sale at The Clock Depot including the 635-184 at discount prices.